Black Barber Salon Airport Reception Waiting Room Bench 2-Seat and 1-table Design. Stainless steel construction stylish, economical, and durable, this bench is built to stand up to the heavy use of abusy office or outside environment. Stylish fits perfectly for livingroom, family room, bedroom, lobby, hospital, barber salon,beauty salon, office waiting. 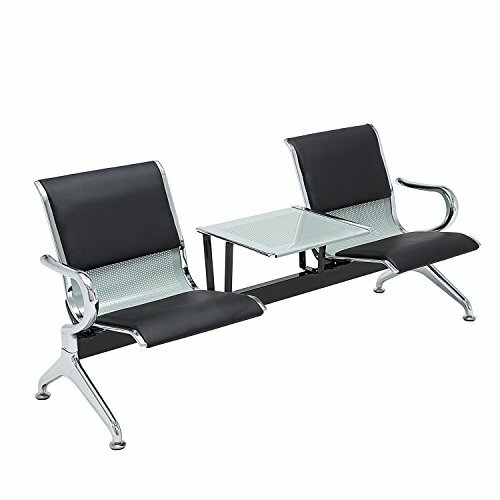 Stylish fits perfectly for office, bank , Hall, lobby, Hospital, Exhibition , Barber Salon, Beauty Salon, Office Waiting Room. If you have any questions about this product by Sliverylake, contact us by completing and submitting the form below. If you are looking for a specif part number, please include it with your message. Bariatric Big & Tall Chair Black/400 lbs/26"